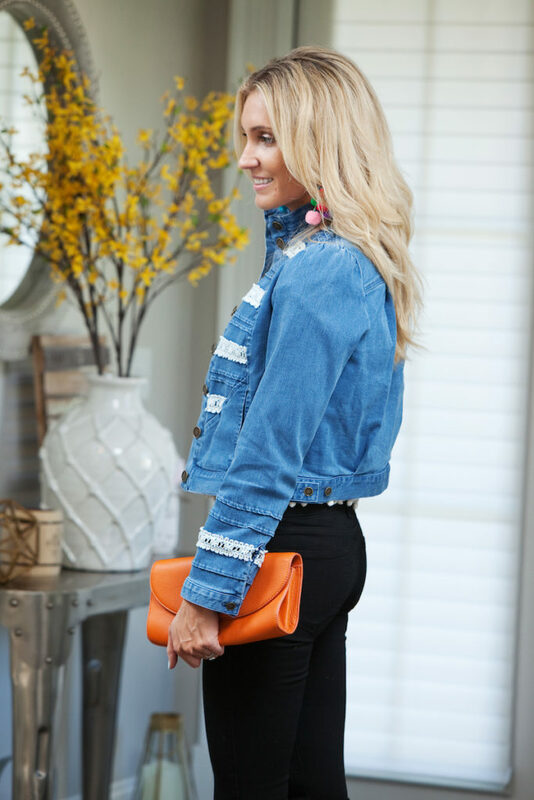 So can we first talk about how much I'm loving the embroidered jean jacket trend right now?! I've had the same jean jacket probably for about 7 years. No joke. haha! And I have worn it every season for 7 years! (Maybe even longer). I purchased it at Zara, and I wear it every spring. So this spring, I treated myself to an updated version! (I still have my Zara jacket, and I'm sure you'll be seeing it!). I LOVE my new jacket from Anthropologie. The embroidered lace detail make it so girly, I can hardly stand it. Plus it's cute with just about anything. That's what I love so much about a great jean jacket. You can rock it over just about any look you want. And have them for years!! This orange Tory Burch Clutch is also a fun added pop of color to just about ANY outfit you have on. It can be dressed up or dressed down. I fully believe a bright colored clutch can add so much detail and make any outfit you have on into a statement piece. You will always see me with bright colors and pops of hidden color here or there....because my eye is always drawn to them. Since I can remember! I've always been drawn to bright colors. They are cheerful to me, fun, festive, happy, and I love color (Maybe this is why I was a hair colorist for so long? haha). You can see this in my house as well. I decorate with a pop of color, in almost every room. 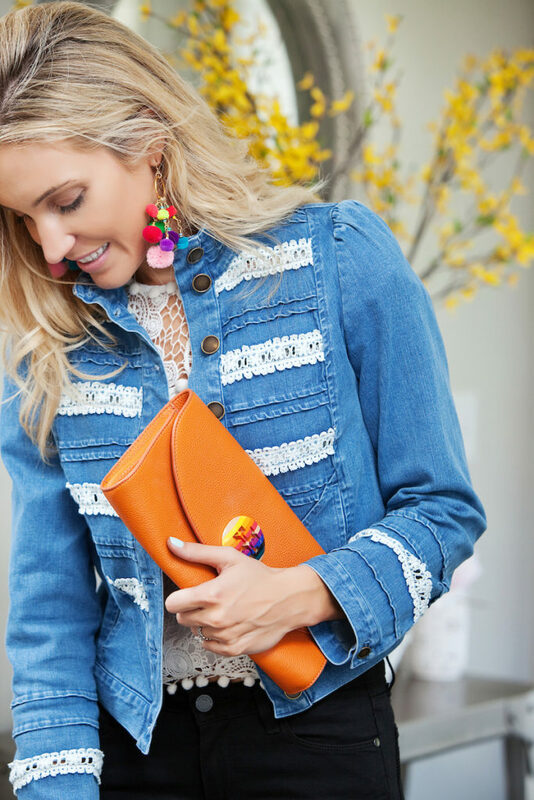 Unfortunately, I have had this clutch for many years as well (just like my Zara Jean Jacket), so I couldn't find the exact clutch, but Tory Burch is known for their bright and fun colors. Of course they are still making bright orange purses. I have linked a couple to this post! I also am obsessed with these block heels for spring and summer! They go perfectly with almost every outfit and come in 3 different colors. I hope everyone has a great week! Be on the lookout for my Friday Favorites this week!! I'm so excited to share my workout that I'm so passionate about!